For powering different machines and mechanisms and are used as parts for specialized machinery construction, fire fighting, municipal cleaning and oil & gas. PSM manufactures industrial pump sets for different liquids: clean, contaminated or salty water, pulps, fuel with flow up to 5400 m3/h. Pump sets equipped with diesel engines YAMZ, MMZ, TMZ, Doosan, Volvo Penta and pumps Rovatti, split case and multistage centrifugal, horizontal end suction, foam and self-priming pumps, screw pumps for muddy water and dredge pumps. There are 70 models of diesel pumps with a large range of different characteristics in our catalogue. When you choose a pumping unit you should know it’s head and flow up characteristics. Specialists of PSM help you to choose the right model of pumping station and optional outfit. You should write all requirements to the equipment. You can choose a model from the production models in the site or order you unique variant. PSM projects and manufacture industrial pumping sets in it’s own factory in Yaroslavl. Equipment of plumps selects according to the requirements of project. Clients fill in the questionnaire, and specialists of PSM choose plumping unit and optional outfit. Equipment of the DNU series apply to different kinds of liquid, which are differ in viscosity, density, temperature etc. There are diesel plumps for delivering water, pulps, fuel. Diesel pumping sets for pure water are made with engines MMZ and staffed with flanged pumps Rovatti (Italy). 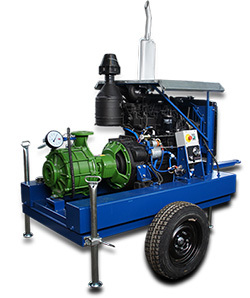 This series of diesel pumps are used in agriculture, firefighting and building. Diesel pumping sets with type pump D are used to transfer pure water in firefighting systems, watering and for heat supply. Motopumps Strong Series transfer water with hard stones size 90 mm. DNY with sectional centrifugal pump type CNS are used to transfer high pressure water. They are tested pipelines, worked in firefighting systems. Diesel pumping sets with pumps GrAu,GrT, GrAT, GrK, GrAK (ground pumps) are used to transfer water with abrasive inclusions. Diesel pumping sets with self- adsorb pumps are used to transfer water without mechanical impurity. Diesel pumping sets with feed pumps are used for pure water, steam condensate or high temperature water. PSM company have OEM- certificate from producers of pumps Rovatti in Russia.